Even before the Comanches claimed West Texas, Spanish explorers were already familiar with the Llano Estacado-the Staked Plains- and with Ector County. By 1684 three important Spanish expeditions had traveled through our area. Their written accounts described Ector County's lush grasses but the lack of people to convert, easily available water and typical riches delayed any permanent settlement in the area until nearly 200 years later. In 1849, gold fever brought Captain Randolph E. Marcy of Fort Smith, Arkansas through our area and rekindled the interest in its development. 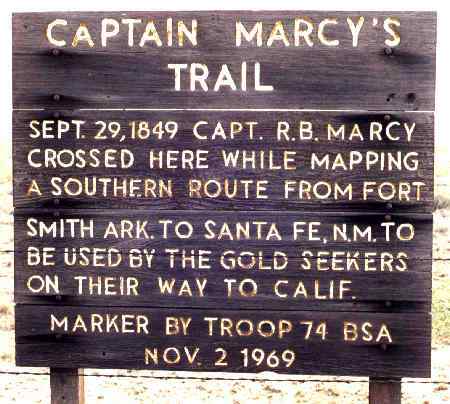 Marcy had been ordered to find the shortest route to the gold fields of California. His expedition eventually brought him east from the Monahans sandhills through Ector county, across Midland County to Mustang Spring, just west of Stanton. His work served as a guide for Captain John Pope of the topographical Engineers of the US Army who came to West Texas in 1854 and is credited with bringing the railroad through Ector County. To those desiring more details of the location in Ector County of Marcys crossing please Read the data from Howell Engineering report of 1996. This denotes the path to the sign now posted on Highway 302 showing Marcys Crossing. 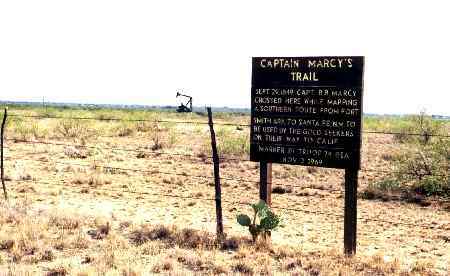 History quotes show Marcy had great difficulty crossing the sand hills from Monahans to Ector County. With the loss of animals because of the lack of water and the slow head way thru the sand with the heavy wagons; some of the wagons were abandoned in the sand. He was most thankful to find the water at Mustang Spring. The Heritige Of Odessa Foundation, Anne Sherburn.